Here at Irish Emigrant Trails we do not want to waste your time. Irish family history research is not always easy. Records dealing with your family may not be available, searchable or even exist. 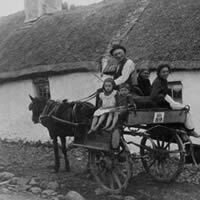 The good news is that there are still many, many resources for Irish family history available. An ever increasing number of services are now being made available to the public. Our free assessment of your Irish family history will tell you whether or not sources and documents about your family are likely to be available. You tell us what you know, and we carry on from there. If records are available, then great, you can go ahead and ask us to start putting together a unique Irish Emigrant Trail based on what we find. If there are few or no records available, or you if are not sure of your Irish family history facts, then we also offer a general trail to meet your needs. Would love to start the process . My grandparents Michael Power and Alice Obrien came from Fethard Ireland in 1903. We went to Fethard to do some genealogy research.i found his birth and baptismal announcements from the church but didn’t find much more. My great-grandmother was Alice Powers, my great-grandfather was Luke Gregory. They both came to the area of Ralston Iowa from Sheffield ILL. where he was a pharmacist., they were married at St Patrick’s church, Alice’s mother was a Delaney. Sugar Loaf Cemetery In Marshall County outside of Henry; The land was donated by Francis Gregory(relationship unknown) and it is mainly a family cemetery. It is still open and has a board of trustees. (this man is my great-grandmother’s brother):1914 debuted the short-lived Federal League after John T. Powers of Chicago convinced a group of entrepreneurs that the growing popularity of baseball could support a third major league. Eight teams entered the inaugural season with clubs based in Brooklyn, Chicago, St. Louis and Pittsburgh as well as Baltimore, Kansas City, Buffalo and Indianapolis which had been the home for AAA teams. All eight cities constructed brand new ballparks including the Chicago Whales who played in what would eventually be known as Wrigley Field. My ancestor was from Ireland and his name ws Holt or Hoyt, or the irish spelling or pronounciation of those names. All I know is that he was a deserter, who jumped ship when near Shelburne, N.S. can., swam ashore and changed his name to John Brown. Guessing that his name may have been in the Police Gazette/Hue & Cry. He was born in 1813. Would love to break down that brick wall. Would love to start the process. I live in Quebec city. My father was Michael Bergeron and his mother was Mary Florence Labbé. His grand-mother was Johanna Holland (1861 sometimes 1858, 59 or 69-1932 died Québec and his buried in the St-Patrick Cemetery, she married Michael Labbé in St-Patrick church Quebec November, 15, 1886) ) She was born in Tipperary and she came as an emigrant in 1871 with Elizabeth her oldest sister(1855- or 59-died in 1897 in Quebec and her mother (great grand mother of Michael) Johanna O’Brien Holland (1818-1883 died in Sillery, Québec, Canada) (she was married with Michael Holland). May be Michael Holland died before she left or died on the boat. I don’t find any records of him. In 1881, there was a Canadian Census and we can find Johanna Holland, widow, aged 63, Elizabeth Holland aged 26 and Johanah or Johanna Holland 23 in the parish St. Colomb of Silvery, Quebec. My grandfather died in 1963, in Hampshire when my father was just 5. I have traced his birth back to dungarvan, 1908, and now have his birth certificate, and now know the names of both his parents. I am confident this is him, however it states he was born in the workhouse, and there are no admission records. However I wondered if there were census records for 1901 and 1911 for the workhouse – I cant find a street address or a record of my ancestors…the person who reported my grandfathers birth, J Walsh, was also in the workhouse. As my grandparents names were so common – mary walsh and john power, I cant trace them any further back! Where should I go next? Laura – this page may be of interest – it contains some information on the Dungarvan workhouse – you may already have seen it. http://bit.ly/1QZd8MX This second link contains the files and records references that Waterford City & County Archives have on the workhouse http://bit.ly/1U6pPL9 , however because you have your great-grandparents names, and therefore have a way to possibly further trace them, I would start with them. The workhouse records, if anything, are only likely to mention John Power and perhaps not say much about him. I have also found a potential match in the 1911 census in Dungarvan for a 3 yrs old boy named John Power living with his mother (married) but with no father enumerated. Drop me a line on info@irishemigranttrails.com and we can discuss it further. I think Laura’s email is available under her previous comment Liz ? So glad to have been able to put you in touch – let me know if you need help with the research lines. My great great grandfather Michael Power was born in Ireland Waterford area around 1775. I believe that he had at east two brothers. They were James and Edmund. He immigrated to Newfoundland around 1800. He lived in a place in Newfoundland named St. Mary,s at one time. Folk lore also suggest he may have come from Cork. Don’t have any paper records. Any suggestions ?